Every Saturday my siblings visit my little family and we have sibling breakfast together. Since most of them love pancakes, pancakes is usually one item that is always on the menu. I researched quite a few pancake recipes, but found that Buttermilk Pancakes are always the best. 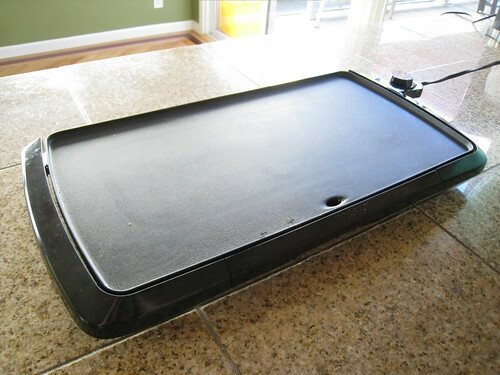 When making Buttermilk Pancakes, I like to use a electric griddle instead of using the pan on the stove top to cook the pancakes. 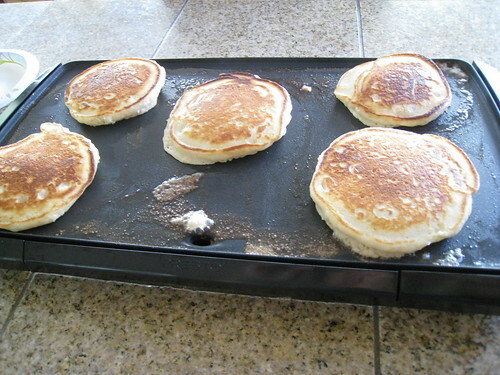 I find that the pancakes cook more evenly on the griddle when I cook it at 350 degrees. I think it’s pretty neat when my siblings come over, I can just bust out the griddle and cook breakfast in front of them while we all stand/sit around the breakfast nook talking about our weekend plans. A great way to entertain. According to my America’s Test Kitchen Family Cookbook, if you don’t have buttermilk handy, you can substitute 1 cup milk and 1 tablespoon vinegar. 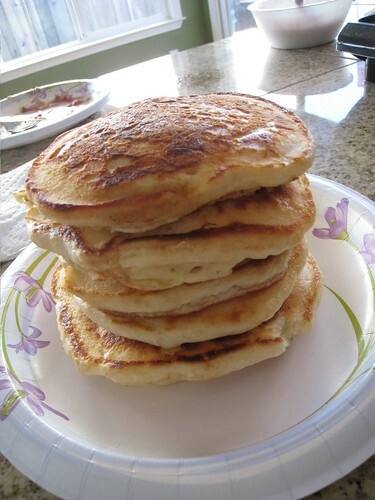 After making pancakes with real buttermilk and buttermilk substitute, oddly, I like the buttermilk substitute better. I guess that is alright because I don’t have to buy buttermilk and the pancakes tastes better. Below you will find my strawberry sauce recipe I created. Usually I add orange juice to the recipe, but since I didn’t have orange juice, I added water and squeezed some lemon juice to it. I think both versions work very well. You should play around with it and see what works for you. In a bowl, add flour, sugar, baking powder, salt, and baking powder and mix. 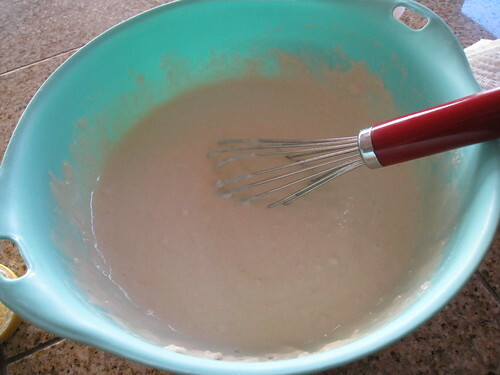 In a separate bowl whisk unsalted butter, egg, and vanilla extract. Slowly pour in buttermilk and whisk. Add liquid ingredients to dry ingredients. Whisk until incorporated. DON’T OVERMIX!!! It is okay to see lumps. 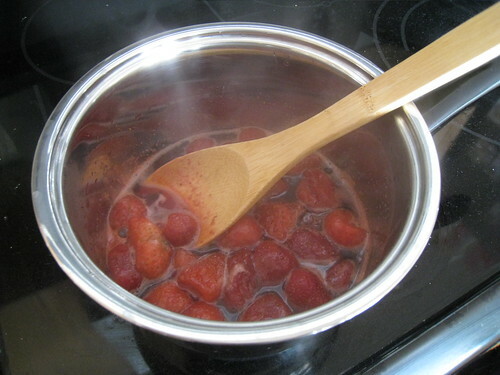 Add strawberries, sugar, Strawberry preserves, water, and lemon juice to a small saucepan and bring to boil. In a small bowl, mix corn starch with a little cold water, stir, and slowly pour into strawberry sauce to thicken. 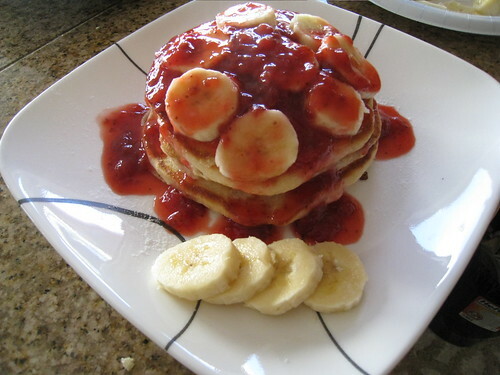 Put pancakes on a plate, add sliced bananas, pour strawberry sauce over pancakes and ENJOY! 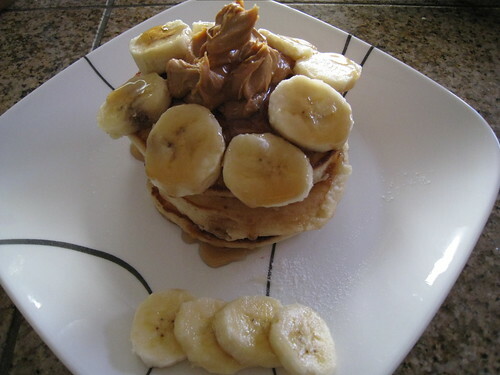 Put pancakes on a plate, add sliced bananas, scoop peanut butter on pancakes, drizzle Aunt Jemina syrup over pancakes and ENJOY!